Poet Robert Louis Stevenson was speaking to Real Estate Professionals all the way back in the 1800’s; well, he was speaking to all of us, but I think this quote truly captures the spirit of long term success in this tough industry: ‘Don’t judge each day by the harvest you reap, but by the Seeds you Plant!’ I will paraphrase my understanding of it and invite you to the same: The Seeds of a focused Real Estate Professional are the activities of Prospecting for Sellers and Buyers; the harvest is obviously clear. It is the seeds of prospecting that create the future, yet many of our agents sit on the sidelines looking for business to land in their lap - The skills of Door Knocking; Direct Response Marketing; Direct Call Marketing; Drip Campaign Follow Ups, are more important today than ever. None of your marketing in today's age can exists without a direct thread to Internet Visibility. 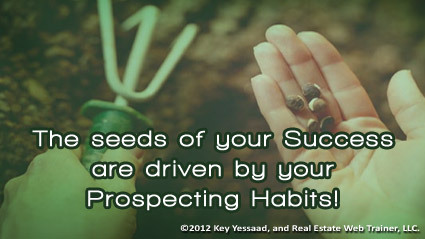 So choose of nurture your day with prospecting activities; take classes and seminars that will help you develop the habits and skills of prospecting; and the seeds you toil to plant today will reap a bountiful harvest!